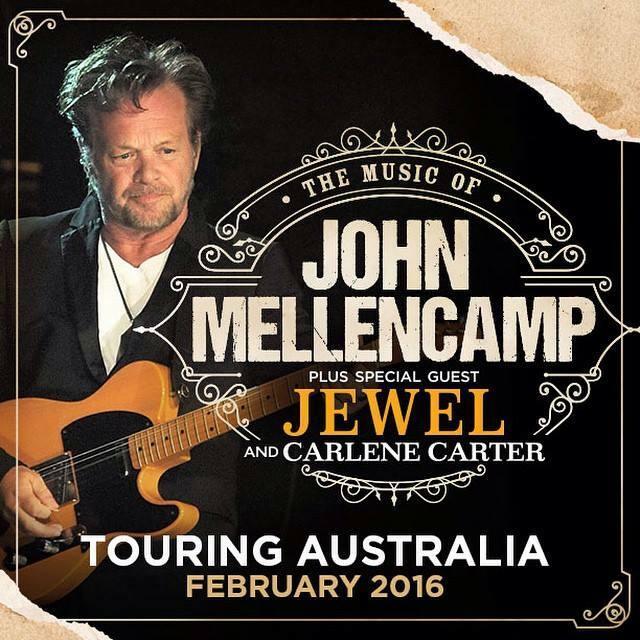 Australian audiences can see John Mellencamp during a seven-date tour of Australia in February 2016, supported by a special guest, singer and songwriter Jewel. Also appearing on the tour is country artist Carlene Carter. The musician – whose extraordinary list of honours includes a 2001 Billboard Century Award, the Woody Guthrie Award in 2004, a Grammy Award and the Americana Music Association Lifetime Achievement Award for Songwriting – was inducted into the Rock And Roll Hall of Fame in 2008. In 2012 he was awarded the John Steinbeck Award, which is given to artists who capture “the spirit of Steinbeck’s empathy, commitment to democratic values, and belief in the dignity of the common man”. Mellencamp.com Pre-Sale tickets will go on sale Tuesday, October 20th at 10 AM Local Venue Time. Premium Ticket Packages will be available in both the Pre-Sale and Public sale. Please watch the TOUR page of Mellencamp.com for Pre-Sale and Public ticket sale updates. Tour promoter Dainty Group’s website will, also, be a great source of ticket and package links and details. Premium Ticket Packages: Watch Mellencamp.com’s TOUR page for details on premium ticket packages offered for shows on the Australian tour.